CRISTINA FERNÁNDEZ, President of Argentina, condemned the recent killing of the United States Ambassador to Libya, charactering it as terrorism. Noting that there were many interpretations of various events occurring in the Arab world, one of which was known in the Western world as the “Arab Spring”, she said the diplomat’s death had been no accident and with fundamentalists opposed to peaceful ideas, it was important to understand clearly what had been happening in the region. “Before we choose the language of weapons, we must choose the language of diplomacy”, she said. As for the Israeli-Palestinian conflict, there was a need to recognize Palestine as a State, she said, adding that Israel must accept the 1967 borders. The situation had dragged on for decades without any constructive progress. Since the 1980s, the IMF had been unable to carry out its mandate effectively, allowing some countries to sink deeper into debt without oversight, she continued. Addressing the Assembly in 2003, she recalled, her predecessor had appealed to Member States to give Argentina an opportunity to grow. The country had restructured its debts, which had allowed it to spend more on social programmes, which in turn had led to economic growth. She emphasized that over the last 10 years the global economy had been driven by emerging economies like Argentina, which was not accused of protectionism by the countries that had protected their own farmers for many years. Argentina’s debt had fallen from 160 per cent of GDP to only 14 per cent today, with creditor countries shouldering the burden of restructuring its debt. On international territorial disputes, she said 2013 would mark the 180th year of the United Kingdom’s illegal usurpation of the Malvinas ( Falkland Islands). Many resolutions issued of the General Assembly’s Fourth Committee (Special Political and Decolonization) and other entities had all asked the United Kingdom to sit down with Argentina for dialogue, but it had refused. She called for the demilitarization of the South Atlantic, pointing out that the international community did not represent multilateralism when permanent members of the Security Council had the right to flout resolutions. The dispute was not a bilateral matter, but a global issue that presented a chance to end colonialism. She also called on Iran to enter into talks with her Government regarding the 1994 terrorist attack in Buenos Aires, proposing a meeting of foreign ministers in New York on the margins of the general debate. 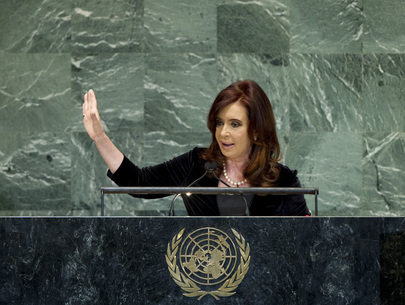 The Argentine Government was prepared to have a trial in a third country to guarantee fairness and justice, she said. Argentina would take a non-permanent seat on the Security Council for 2013-2014 and would make sure to represent every country seeking peace and security.